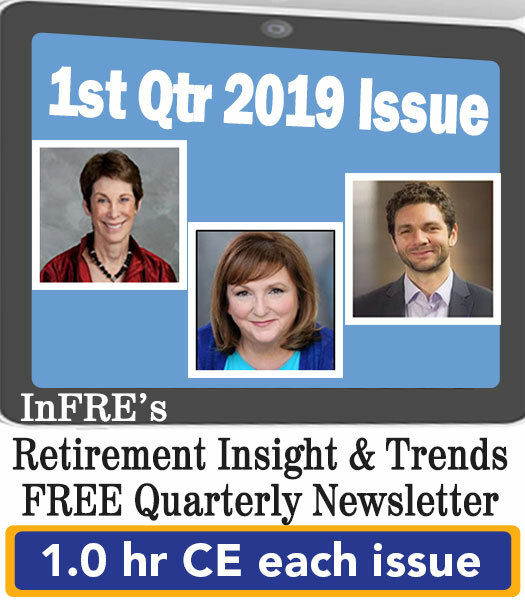 You may also choose to take the full length course Retirement Planning Beyond the Dollars and Cents for 1.0 hour continuing education (CE) credit. People have an idea of what retirement is going to be like, but when they get there, it’s not the same. The first thing that is different is that retirement is difficult. It’s the most anticipated but least understood phase of life, and it’s because we have these vague ideas and assumptions of what life is going to be like, and when we get there, it turns out very differently. There’s a study that says 80% of people think that life in retirement will be better, but only 40% of people in it find it to be that way. That’s a significant disconnect, and the disconnect is because people don’t go into it with a plan. They think, “Oh, it’s going to be okay as long as I have the right dollar amount and the asset allocation. I’ll figure out the rest of the stuff.” What they end up doing is wasting the first and best years trying to figure out how to make it work. It doesn’t have to be that way. We’ve got plenty of knowledge, experience, and resources to help people overcome that. The other part about the new retirement reality is that retirement is disturbing. It’s one of the most traumatic events people will go through, and it’s simply because everything that’s important to them gets pulled away. The analogy I use is when you were growing up and got grounded, what happened? You couldn’t talk to your friends, go out, or do certain things. That’s what happens in retirement. You get all this stuff – work, friends, relationships, and health – pulled away, and it can be a traumatic transition for people, and they don’t know what to do about it. If you’re in retirement and someone says, “How is retirement going?” You can’t say, “Oh, it’s not good. Things are terrible.” People look at you like an alien or monster because it’s supposed to be the best time of life where everything is perfect and falls into place, but that’s not really what happens. People don’t know whom they can turn to and talk to about it. The other thing is that retirement is dangerous. The two most dangerous years of your life are when you born and when you retire, and the reason is that of the failure to thrive. If you think about newborn babies or orphans, they struggle if they don’t have the human touch, the interaction, or that love, and that’s what happens to people in retirement. So, we’ve got to start alerting people to these things instead of this idea that it’s all perfect and good. Now, I know I’m not far into this and I’m talking about major buzzkills, but my philosophy is simple. We need to vaccinate people about retirement. We need to start letting them know about it. If you think about what vaccination does, it injects a small part of something negative into your body so that your body will build up defenses. That’s exactly what we must start doing with retirement – injecting somebody with a little bit of this stuff. We don’t have to hit people over the head with it or make them feel bad, guilty, or anything like that, but let them know, “If you don’t go in for a plan for everyday life, you’re going to face some of these challenges.” Creating this awareness is the whole key. We’re not suggesting turning advisors into therapists or anything else, but simply raising awareness, educating, informing, motivating, and inspiring to help people create this successful transition. The best way to make a successful transition from work life to home life is to have a home life already. That’s the critical thing that we want to start having those different conversations. Don’t wait to start walking or eating better. Do it now, so you’re just continuing it in retirement because retirement magnifies what you already are. If your clients like to sit around and do nothing, they’ll have more time to do it, but if they’re busy, they have other roles, other relationships, and if they’re working out and doing these things, they’re just going to continue with that. The trends and science of retirement are critically important because what I’ve found with coaching is that there’s a “fluffy” perception about it. “You’re going to meet with me in a coffee shop, and I’m going to fix all your problems in 45 minutes.” That’s not true. We have to look at the trends, science, and leverage that for credibility to help people understand why the psychology and these non-financial things are so important. If you look at Robo-advisors – Schwab’s got their low-cost trades, you get your money back if you’re not happy. Schwab has all these trading platforms, but what’s interesting is they’re all nonhuman. It is resulting in fee compression, so people are charging lower fees. I’ve seen some advisors going to a flat fee no matter what a client brings as far as assets. The human factor is the reason why I haven’t lost any clients to a Robo-advisor, and I’m not building my own Robo-advisor platform because I like people. I was recently at a conference where Nick Murray talked about the Golden Age of the Advisor, and it’s the golden age because the human factor matters – you in your role with your clients. Again, we’re not turning you into a psychologist or a therapist. We’re just helping you ask better questions, dig a little bit deeper, and help people have an impact on their personal lives. Retirement isn’t changing. It already has. The train has left the station. You can be on the front end of this curve if you want. The nice thing right now is that there’s not this perfect model or perfect plan. You can be a pioneer and an innovator out there. These non-financial pieces and have had a significant impact on my practice because no one else is doing it. I’m not asking amazing questions, but if I ask a client to write down what a perfect day and a perfect week looks like, they have these “Aha” moments that they can’t believe. Do you know why? No one else is asking them to do it. It’s not hard. It’s not rocket science. There are some simple things you can go through to have a major impact on people. There are some fatal flaws in traditional retirement planning. First, we’re just going to make retirement plural. This is your first retirement, your second, or your third. It doesn’t create the stigma that you’ve retired, and you’re done. You don’t have to say you’re retired. “I just retired from my first gig. I’m looking to start my second or my third, or I’m going on to this.” What’s important is for us to look at changing our mindset. Another flaw of traditional retirement planning is that it assumes clients don’t like what they do for a living. That’s not true. I know many people who like what they do for a living, but it’s confusing because there are age stigmas. When you get to 62 and 65, you’re supposed to retire. Let’s be honest: If you’re 70 and you’re still working, you either didn’t save enough money or you don’t like your family, right? Those are the social norms that are out there, and that’s what we have to change. Some of the questions I ask clients and write a lot about is, “How do you win at retirement? What do you have to do to be successful at retirement?” You can’t use the things that you were successful at work with to measure if you’re successful in retirement. Another assumption is that freedom from work won’t enslave clients to something else. I can’t tell you how many clients turn into conspiracy theorists. They retire, they sit at home, they watch political TV all day, and suddenly, the world is filled with Russian spies, and everything is coming to an end. Or, they turn into a full-time nanny, or they’re at the casino gambling more, or they’re drinking more. Just because you have more free time, it doesn’t make life better. Clients must have something to do during that time. There’s also the flawed assumption that people can save enough money to do nothing for 30 years. Everybody knows the story of Social Security. When it was instituted, life expectancy was 61. You weren’t supposed to get it. Now, it’s 84 and 87, or maybe it’s a little higher, so people are living longer, and they’ve got to have things to do. Starting a business, volunteering, part-time work – there are so many factors. It’s good to tell people that it’s okay for them to work a little longer because it’s unrealistic to expect to have enough money to maintain your lifestyle for 30 years. How Well Do Retiring Couples Like and Understand Each Other? For the most part, couples are not on the same page. We created one of the first couples’ assessment, and it looks at 28 different factors for couples. They can either mark each question as “thought about it,” “talked about it,” or “agree on it,” and each in the couple answers that question. The software compares their responses. Guess what? Most people aren’t on the same page, let alone in the same book because there’s no one to facilitate those conversations. Dorian Mintzer, M.S.W, Ph.D. is well-known in the retirement coaching industry. One of the things she’s found in her practice, especially working with women, is that women don’t want to live their husbands’ retirement. That’s a powerful statement, and again, it has to be brought up. Many times, there are disagreements with couples – but you’re not there to fix it or do marriage counseling. You have to raise the awareness. These conversations have to start with, “Hey, what are your plans together and apart?” Guys also tend to think that their spouse wants to be with them 24/7, and they don’t, but the guy doesn’t know, so someone has to break the ice and start having these conversations because otherwise, it turns into The Odd Couple where they’re fighting all the time. Grey divorce is increasing. We have to leverage, identify these flaws, share them, and help people work through them. How Do Misperceptions About Longevity Misdirect Retirement Planning? People are confused by longevity. It’s a broken record. How many times have we all heard that we’re all living longer? What most people do is what I call “assembly line thinking.” They think that they’re living longer, be less capable for a longer period, so they tack those years on to the end. When you’ve done planning for a baby boomer, this is evident. When you ask about family health history and how long they think they might live, they say, “Well, my mom lived to 90, but my dad lived to 85.” “Okay, we should project out that you live to be 95 or 100.” They’re like, “Ninety-five or 100? If I live to be that old, just take me out back and shoot me.” Well, we can’t do that. However, their thought process is that they’re going to be less capable for a longer period. That’s not necessarily true. This is where coaching comes in. It’s not about negative things, but inspirational and motivational things to help them change careers, go back to school or start a business because they’ve got plenty of time and plenty of capacity to continue to push forward. It’s our job to change that mindset, especially about age in that category between 50 and 75, because they get there, they look good, they feel good, they just need permission to step outside of the box and continue to deliver until they’re ready to retire because of the benefits works provides and gives to them. When you ask people who have retired, “How is retirement going?”, what do they say? “Oh, good! I wish I’d have done it before.” What do you mean? What are you doing every day? They can’t explain it. It’s a cliché answer. They say that in response because retirement is supposed to be awesome. The new era and new mindset must cover new skills and habits. The other big issue I see, especially with retirement, is that you can do some volunteer work in retirement. Well, guess what? You sign up for this program to volunteer, you’re all excited, and you get there, and in the first couple of weeks, you’re miserable. It’s not rewarding, it’s not what you thought, but you kind of feel trapped. Then, what do you do? You’re stuck. It’s the same with part-time work. Guess what? Nobody needs an employee from 11:00 a.m. to 2:00 p.m. on Tuesdays and Thursdays in the winter months for $20 an hour, but people go into it with those perceptions. If you want a part-time gig, get out there, fill out some applications, do some interviews, and see what’s available to see what it’s going to be like instead of just plugging in that you’re going to make $25,000 a year with this part-time gig, because that might not be possible. It’s not rocket science. There are straightforward ways to implement some of these things. Why not provide training for people to get part-time work, to start a business, and to do other things? There are a lot of opportunities there. What Does Research Tell Us About Retirement? Most human misery is not due to economic factors. It’s due to the things that we do to ourselves or don’t do. This is an important point of how people set themselves up for retirement. Harvard has a great adult human study on this, and there are some TED Talks on it. The real reality is that people who are more socially connected are happier, physically healthier and live longer than people who are less well connected. My research shows hands down that your social network is the most critical function of your wellbeing in retirement, not only just because of how you feel connected and how you stay relevant but also because of your health – in particular, your brain. This is another powerful opportunity. No one’s talking about their brain in retirement, but when you look at the research, what we know is that older adults fear Alzheimer’s disease more than any other life-threatening illness, including cancer, stroke, and heart disease. The brain is critically important, and here’s why: What happens when you don’t have your memory? That’s what really provides the most value to you. Without our memories, our life has diminished meaning. It’s important to talk about this with people and say, “As part of our plan, how do we protect your brain in retirement?” This is a topic that’s also very important to educated people, especially academics. One of the articles I wrote is called, “What Happens to Smart People in Retirement?” I joked that your brain turns to mush, you forget everything, and no one likes or appreciates you, or cares that you did all those lectures, or wrote all those papers. Of course, this is not true, but the whole idea is to push people to think about the choices they’re making and what’s going to happen to them later. There’s something called a value/behavior conflict, and this is what many advisors or so-called “life planners” do. They ask people: What do you value in life? List them out. Our behaviors don’t always support our values, so we have to cause a collision course to help them recognize that their behavior is causing a problem with this value. They then either don’t value it or they have to change their opinion. That’s a meaningful way to help people start to make personal change. There’s a great book out there called Motivational Interviewing that talks about the concept of creating a collision between a person’s values and their behaviors to help them connect the dots. Of course, physical exercise also makes a big difference. Our brain needs a good supply of oxygen to function effectively, so again, it’s not just talking about how you need to be healthy or do these things; you’re encouraging clients and giving them context. For example, if in retirement you want to start walking and eating healthy because it’s going to protect your brain, and if you’re walking with a group or doing other things, you’re going to be connected socially. Done together this will help you protect your brain, live longer, remember your life, and give it more meaning for a more extended period. It’s important to help people connect the dots. What Really Happens to Retirees? In our research with over 12,000 people, we found that less than 20% of boomers have a written plan for what an ideal day and week will look like in retirement. Eighty percent of new or impending retirees don’t have a plan for everyday life. They have not taken the time to do it. Once again, if you want to have a big impact right away, when your clients come in, and they’re on the verge of retirement, literally have them write down what a perfect morning, afternoon, and evening looks like, and what a perfect Sunday, Monday, Tuesday, Wednesday, Thursday, Friday, and Saturday look like. They won’t be able to get past Tuesday without being flustered or frustrated because they don’t know. They’ve never thought about it. This can be a catalyst for them planning for retirement differently. Also, over 60% of our study participants do not attend or participate in four or more social events each month. Think about that. Of course, people are working and have other obligations, but while they’re working and connected to people, they’re going out with a group fewer than four times a month. What do you think happens when they’re not connected to that same group? Even if you’ve worked there for a long time, and maybe you are best friends with them, you think nothing is going to change when you retire. It will. Forty percent of boomers said it was difficult to kneel or stoop, stand for two hours, walk a quarter mile, or climb ten steps without resting. What does that really mean? You’re not on the floor, playing with the grandkids. You’re not out gardening. You’re not out planting flowers. You’re not out riding your bike. They think retirement is going to be one thing, but they get there and find it’s not. Another big thing that happens to people is they put off the relationships, especially with their kids. They work hard, then they get there, and they’re surprised when their kids don’t have time for them. Well, they didn’t have time for their family first, and that causes family conflict. Again, these are just pieces that we see all the time that need to be open for discussion, raise awareness, and help people start working toward solutions. A book called Retirement Maze states that when you’re working, you have on average 22 high-quality interactions each day. “High-quality” means face to face. You’re engaged and participating with people. However, when you retire, that number gets cut in half, and you end up with 11 low-quality interactions. “Low-quality” means email, text, or phone. There’s a significant difference. This is also a big part of why many people assume a natural part of aging is depression, but it’s not. It’s not a normal part. It’s what happens if you don’t stay connected and relevant, mentally and physically active. What is a Successful Retiree? How do you explain this to people? We look at five key areas: Spiritual, mental, social, physical, and financial. For spiritual, we’re not going to try to ordain you or give you a list of “Thou shalt nots.” We define it two ways: Internal and external spirituality. Internal is what makes you tick. What are your beliefs, values, and feelings? External spirituality is if you’re going to go to church or have some religious affiliation – so, two separate things. Internal spirituality is important because once we know what you value, what you feel, and what you’re thinking – that builds into the mental part – whom you hang out with, what you do with your time – and that leads to what you do with your money. What I tell people all the time is if we can get the personal stuff figured out, the money stuff falls into place. It’s a very simple approach to explain to people how this works. If you know a successful retiree, one who is living life like no one else, who is a notch above, they can probably put a checkbox to four, five, or six of these things. They found a way to replace their work identity. They found a way to fill their time with meaningful tasks. They found a way to stay connected and relevant. They found a way to keep mentally fit and physically active. They have a way to express their spiritual beliefs. They feel financially secure. There is a natural progression towards coaching in your business to help you differentiate your practice from the rest. You’re an advisor, so you advise. You do some consulting. Coaching is very similar. People are open to taking advice on their finances, but you can’t always tell people what to do with their life. That’s where coaching comes in and being able to nudge, educate, and help them see the answer for themselves. It’s a suite of tools that you want to have. It’s not only to advise and consult, but also coach. If you’re a number cruncher and don’t want to do this, there are plenty of coaches out there. Many coaches are not advisors. They don’t want anything to do with the money part. There are some easy ways to partner with retirement coaches to offer this service and make yourself stand out a little bit more. 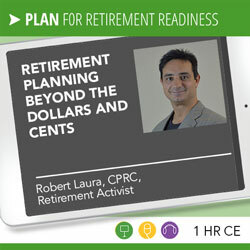 Checkout https://www.retirementcoachesassociation.org/ for more information to help your clients make a successful transition to retirement.